The hunt for a decent Vietnamese restaurant serving more than just Pho noodles is like searching for the culinary Holy Grail. In the past, my friends and I used to visit Eden Center, a confluence of Vietnamese businesses in the heart of the immigrant community in Seven Corners, VA, to relish in the delectable offerings in our favorite eatery. However, it has moved further away into the boonies, and according to my Vietnamese hair stylist, it is now catering to a more American palate. In replacement, I discovered another eatery, Green Papaya, but to my dismay it folded up a couple of months later after being in business for over a decade. Another favorite haunt in DC also met the same fate after struggling in a part of town that saw gentrification moving slower that it would have liked. With all the Vietnamese noodle joints around me, I was nearly about to resign to my fate of settling for only this type of offering, pho real. Around the beginning of this year, I noticed some renovations taking place in a store located in a strip mall near my favorite Costco. As I passed by it a number of times, I was anxiously waiting for the storefront sign to be put up so I could ascertain what type of cuisine it was going to serve. In May, I was thrilled to see its large name – finally a full-fledged Vietnamese restaurant a few miles down the road from me. I couldn’t wait for the Open sign to glow for my first visit, and I even stopped in and asked about their opening day. 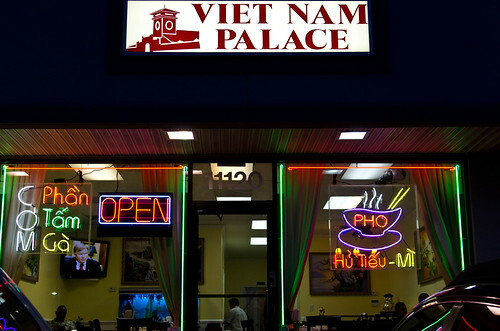 One Sunday, I walked into Vietnam Palace eagerly anticipating my first meal there. However, a gentleman quickly told me that it was not officially open but only to invited guests. However, another man appeared from the kitchen and asked me to take a seat as one of the guests. Since that first warm welcome, I have paid them a few more visits before doing this write-up. On the first visit when I was treated so graciously, I knew I was entering into a place different from the other Vietnamese establishments that I had visited. This was immediately evident from the drink that was placed on my table without my ordering. 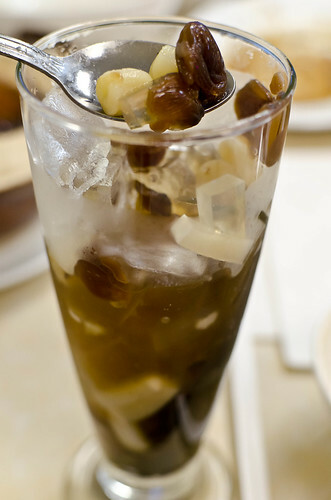 It is listed as “Longan in Syrup” in the drinks section of the menu. It comprises of a slightly sweet drink mixed with bits of agar-agar jelly, reconstituted dried longan fruit, and lotus or longan seeds. I was amazed by the combination of ingredients and flavors, reminiscent of a similar concoction that my grandmother used to prepare to cool the body down during the hot dry season in tropical Asia. The different elements in the sweet liquid made it taste more like dessert than a drink. This is definitely a different offering than the usual but a satisfying thirst quencher. 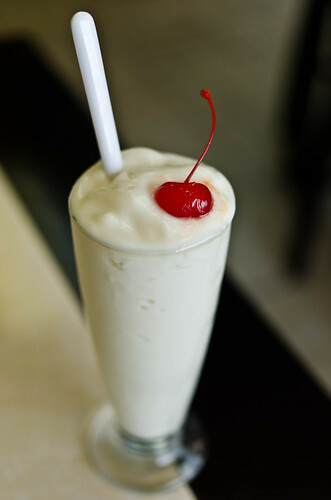 Among the usual drink choices of Vietnamese coffee, Lemonade and Soda Water, and Avocado Smoothie, there is another unexpected offering – Durian Smoothie. When I saw it on the menu, I knew I had to get my hands on a tall glass of it. Mine literally was filled to the brim and I had to quickly take a sip before it started to trickle down the sides. It was rich, slightly sweet, and ice-cold, packed with the distinctive and pungent flavors of the custard-like Durian fruit. It brought me back to my past summer trip to Malaysia when I got my fill of the fresh fruit that overwhelmed my taste buds with its unique pungent flavor. This smoothie had a similar effect on me without the strong aftertaste that the fresh fruit leaves. What a good alternative to the real thing, especially in this part of the world! The first bite I took in this establishment was on a Spring Roll that you will find in most Vietnamese eateries. 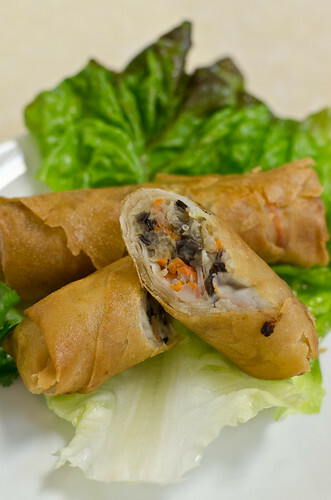 This rendition was as good as you would find anywhere else with its light and flaky wrap, a tasty filling that is made with wood fungus and carrot, minced pork and shrimp, and fine bean thread noodles that make up the customary stuffing. But what sets it apart is its accompanying fish sauce that woke up my senses immediately by the smooth refined flavor that you don’t find in other establishments. It reminded me of the fore mentioned closed down restaurant, Green Papaya, whose fish sauce tasted like a prized elixir. With the flavors lingering in my mouth, I knew that I have discovered a place where attention is paid to the details. Another opener that we tried on a couple of visits is the Sweet and Sour Soup (Cahn Lau) that was part of the set course dinner. 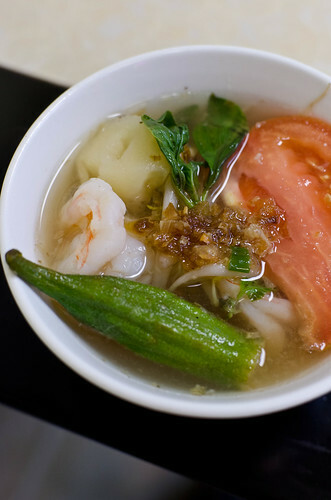 Pieces of fish or whole shrimp are cooked in a light broth along with pieces of tomato, bean sprouts, pineapple, whole okra and celery. The soup has a unique combination of sweet from sugar and the sour piquancy from the pieces of pineapple which I enjoyed quite a bit. The pieces of vegetable were perfectly cooked with the okra slightly firm and not slimy, bean sprouts still turgid but not raw, and the pieces of seafood plump and moist. The sprinkling of Vietnamese mint (Rau Ram) adds the herbal fragrance along with some caramelized shallots that brought another level of complexity to this rather simple soup. 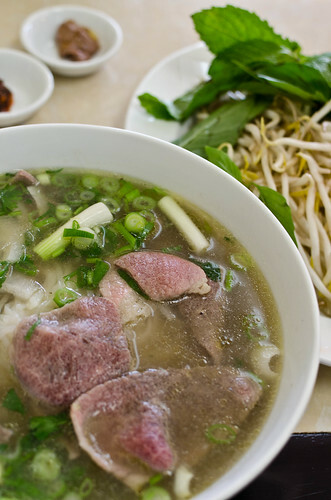 This light yet tasty soup pointed to a direction of Vietnamese cuisine that I had not savored before, which not only was pleasing to my senses but also peaked my gastronomic curiosity. No respectable Vietnamese restaurant will have Pho noodles amiss from its menu, and this is the case with Vietnam Palace. But instead of the usual bowl of beef noodles on my first visit, mine came with strips of chicken amidst large chunks of daikon root. The mild root was tender yet savory from having absorbed all the flavors from the rich broth, a clear soup, clean in flavor, sweet without the customary use of MSG, and I could distinguish the distinctive spices used to make the key element in the bowl: cassia bark (Asian cinnamon) and star-anise. On another visit, the beef version came with paper-thin discs of raw meat that cooked quickly in that wonderful broth. Large pieces of green onion and fine rings of sweet onion added the mild pungency that complemented the rather sweet broth. Getting to know the owner, he told me that the broth changes in the amount of spices according to the time of the year – more cassia and star-anise in the winter time. 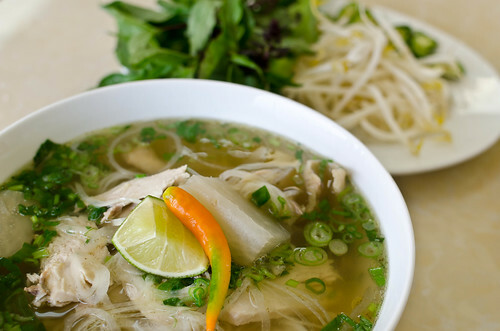 This is definitely not your everyday bowl of Pho noodle. 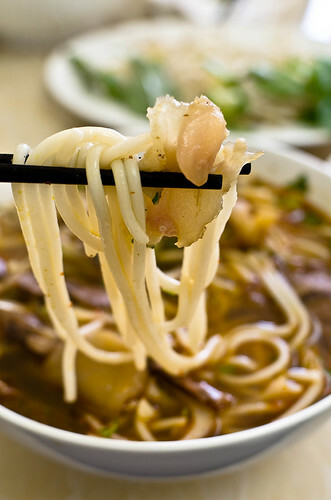 Another bowl of noodle that shouldn’t be overlooked is one that you would probably not find in other Pho establishments – Bo Bun Hue. The bowl is covered with round long rice noodles, bits of beef, and sweet onions, all enveloped by a spicy beef broth made fragrant with lemongrass and reddish from some chili that is the basis of this noodle dish. The pieces of lean meat are joined by cooked skin, hunks of cartilage (a common source of protein in that part of the world), and squares made from congealed blood – this is not a dish for everyone especially for the squeamish. 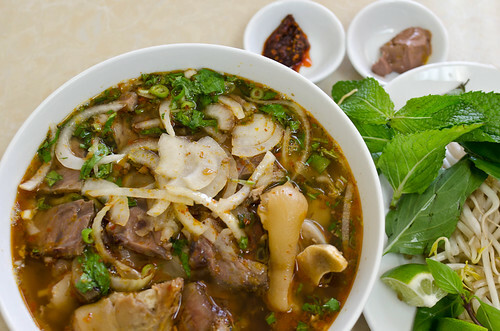 However, what I enjoy about the dish is the level of uncompromising authenticity along with that fragrant and fiery broth as well as the sprinkling of herbaceous Vietnamese mint (Rau Ram). The sides of fermented shrimp paste and dried chili paste add to the experience and its unique flavors. This is a must order for the adventurous especially if you are looking for a noodle dish beyond the usual Pho. Another noodle dish that we have ordered a few times, albeit in a less soupy state, is Egg Noodle with Vegetables and Seafood. 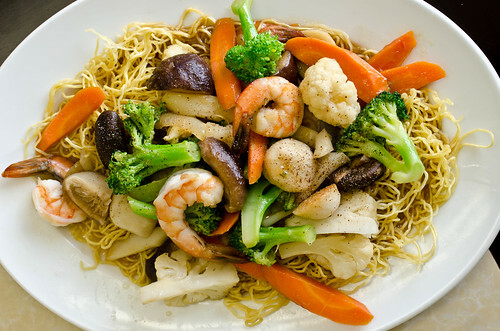 Dried egg noodles have been parboiled and cooked with brocoli, cauliflower, carrots, whole shrimp, fish balls, and shiitake mushrooms. The noodles were still al dente, the vegetables cooked similarly and still fresh tasting, the seafood sweet and moist, and the sauce flavorful and light that was effective enough to coat the pasta. What I enjoyed most was the generous amount of meaty shiitake mushrooms that added a hit of boskiness and a depth of flavor to this satisfying dish. A good sprinkling of biting pepper on the top was the finishing touch that titillated the taste buds, mine at least. In addition to noodle dishes, Vietnam Palace has an extensive list of rice dishes that I don’t usually see in the usual eatery. On one occasion, I ordered Charbroiled Pork Chop, Shredded Pork, Egg Quiche on Steamed Broken Rice. A large piece of lightly seasoned Pork Chop is cooked with a slightly sweet and peppery coating until slightly brown yet remaining still quite moist. The accompanying quiche was something that I had not had before; bits of minced pork were mixed with egg white and topped by a mixture made with egg yolk. I found it quite tasty and amazing slightly spongy and rather light, aided by perfect seasoning and well-timed cooking. The other side of Shredded Pork was equally interesting but not necessarily in the same direction as the Quiche. It is cooked pork skin that has been shredded and mixed with toasted rice flour and seasoning. The texture was a bit off-putting by its soft chewiness along with a slight fermented flavor – definitely something authentic yet one needs getting used to. Mostly, I appreciate the restaurant’s offering of set rice platters that are not usually found in most eateries. A couple of dishes beyond the rice and noodle dishes were tasted and are worth mentioning. 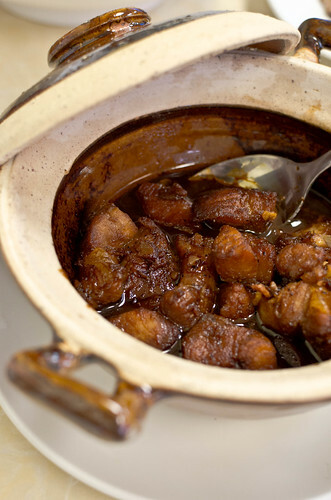 Caramelized Fish comes served in a clay pot swimming in a dark chocolaty sauce coating the fish morsels. The basic flavor components are made from caramelized sugar that provides the slight sweetness and the slight burnt flavor, and the fish sauce that injects the brininess and a breath of ocean into the sauce. The pieces of fish were fresh and still quite moist. However, I thought that the use of fish sauce was a bit heavy-handed which overpowered the subtle caramel element. Upon bringing this to the waiter/owner’s attention, he agreed with me and quickly joked that he was going to fire the cooks, notably his parents in the kitchen. I felt a bit guilty for mentioning this but I’m not shy to help an establishment fix their faux pas. Another try of this dish is planned for the future. Back to my first “invitation” to this establishment. After having sated myself with their wonderful dishes, the owner mentioned that they are offering a family special cooked only on the weekends – Sautéed Goat. When it arrived on my table, the waft that reached my nose instantly told me that this was no ordinary dish. 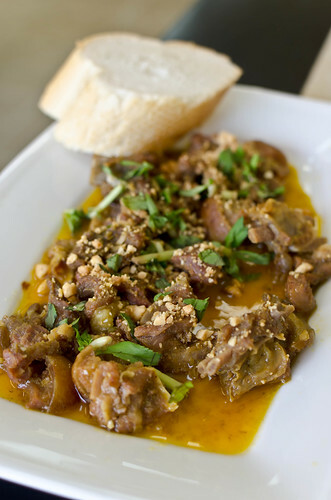 Pieces of goat have been stewed with onion, curry powder, and coconut milk. In addition to the spice elements and rich coconut, it is heavily infused with some heady lemongrass that adds that Southeast Asian zing, along with a sprinkling of crushed peanuts and herbaceous Vietnamese mint (Rau Ram). A thick slice of French bread made the perfect sopping tool for that rich and flavor-packed sauce. Even though the pieces goat were a bit bony, which it tends to be, the bits of flesh were quite tender and well-flavored. This restaurant never ceases to amaze me with the authenticity of flavors and each visit turned into an adventure into this Southeast Asian cuisine. 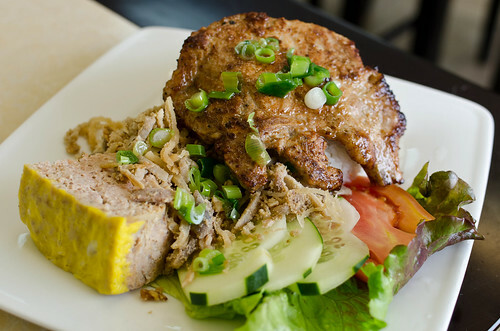 Vietnam Palace is a restaurant worth trekking into the Maryland suburbs for anyone who is salivating for well-made dishes representing this Southeast Asian culture, beyond the noodle bowls that have over saturated the various neighborhoods as well as our taste buds. I still miss some dishes that are not served there, namely Grilled Lemongrass Beef and Salt Pepper Seafood that I used to relish in the closed fore mentioned eateries. However, what this place does well compensates for the missing dishes, and the dishes have broadened my horizon on this wonderful cuisine. Who would think that such gastronomic adventure could be found in a quiet strip mall off the beaten path. It is worth checking this place out! Good to see that you have returned. The photos are ever so inviting, as usual, and you’ve again captured the whole dining experience superbly. I shall now have to go to Little Vietnam here in Chicago in search of some of the dishes that you listed. Looking forward to your next review. Thanks, Gino. Hope you can find something as good in your neck of the hood! So good to know of more places close to home! We will have to go together soon!